The Council of Chalcedon reached the mature traditional formulation of Christ as both fully human and fully divine, having two natures "without confusion, change, division, or separation." The Council of Chalcedon, also known as the Fourth Ecumenical Council was a meeting of Christian leaders in the Roman Empire which established the mature expression of Christian faith known as Chalcedonian Orthodoxy. 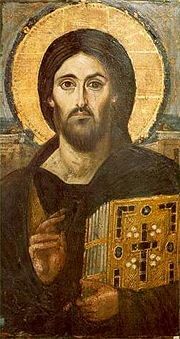 Held from October 8 to November 1, 451 at Chalcedon (a suburb of Constantinople), it attempted to resolve the issue of how to express the concept of Christ as being both fully human and fully divine. Following the lead of Pope Leo I, the council sought a middle path between the extremes known as Nestorianism and Monophysitism, ultimately settling on a formula that affirmed "two natures in Christ without confusion, change, division, or separation." In addition to its theological decrees, the council issued a large number of disciplinary rules governing church administration and authority, including its twenty-eighth canon, raising the See of Constantinople to a position of honor and authority equal to that of the Rome. This rule, however, was rejected by the papacy. The council initially resulted in a major schism, especially in Egypt and the East, as many refused to accept its teaching of "two natures." These were condemned by the Calcedonian faction as Monophysite heretics. Among those who reject the Council of Chalcedon are today's adherents of Oriental Orthodoxy, who consider themselves Miaphysites, not Monophysites, and are now accepted as orthodox by Catholic and Eastern Orthodox authorities. The Council of Chalcedon is the fourth of the first seven Ecumenical Councils in traditional Christianity. The definitions of Trinity and the nature of Christ as outlined by these councils are taken as orthodox among Catholic and Eastern Orthodox Christians, as well as most Protestants. Coin displaying the image of Emperor Marcian, who sought reconciliation with Rome's Pope Leo I and summoned the Council of Chalcedon. The Council of Ephesus had condemned Nestorianism in 431. However, tensions still remained between the parties involved in this council's bitter debates regarding the character of Christ's divinity and humanity. Moreover, theological issues regarding the nature of Christ's divinity and humanity were still unresolved. In 448, the teachings of the anti-Nestorian monk Eutyches provoked a new controversy. Eutyches affirmed that Christ had only one physis (nature), which was both divine and human. Pope Leo I, from Rome, insisted on two natures in Christ, united in one person. The issue was partly semantic and was complicated by differences in shades of meaning between Greek and Latin, but Eutyches was subsequently excommunicated by Patriarch Flavian of Constantinople. This provoked Patriarch Dioscorus of Alexandria to come to Eutyches' defense and influence the emperor to summon the Second Council of Ephesus in 449, which exonerated Eutyches and condemned Flavian. Although Emperor Theodosius II accepted this council's rulings, Leo I denounced it and refused to recognize Flavian's successor. The Christian world also witnessed the spectacle of mutual excommunications between the empire's two most renowned churchmen, namely Dioscorus and Leo. The so-called Monophysite controversy had become a major schism. The death of Theodosius II in July 450 made a new empire-wide council possible with elevation of Emperor Marcian to the imperial throne. Marcian had the bishops who had been exiled under Theodosius returned to their dioceses and had the body of Flavian brought to the capital to be honorably buried. Although the pope preferred that the new council be held in Italy due to travel considerations being made difficult as a result of troubles with the Huns, the council was called to meet at Nicaea, but was moved at the last moment to Chalcedon, where it opened on October 8, 451. Concerned to reconcile with Rome, the emperor asked Leo I to preside over the council, but the pope, following a prior tradition, sent his legates instead. Although he did not personally attend, Pope Leo I was a major presence at the Council of Chalcedon. Attendance at this council was very high, with 500-600 bishops participating. Presiding over this assembly was Bishop Paschasinus of Lilybaeum (Marsala, Sciliy), the first of the papal legates. However, apart from the papal delegation and two African bishops, practically all the bishops belonged to the Eastern Church. Dioscorus of Alexandria, who had presided at II Ephesus, was to be tried for heresy and misconduct and thus was denied a seat at the council, while Theodoret, whom Dioscorus had condemned, was given a vote. Marcian appointed a number of commissioners, men of high rank, who opened the meetings and influenced the order of business during the sessions. Emperor Marcian wished to bring proceedings to a speedy end, and asked the council to make a pronouncement on the doctrine of the Incarnation as the first order of business. The bishops, however, felt that no new creed was necessary, and determined to move directly to a trial of Dioscorus. 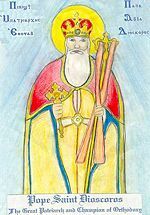 After the acts of the Second Council of Ephesus were read, the imperial commissioners declared that since Flavian of Constantinople and other bishops had been unjustly deposed by the "Robber Synod" it would be just that Dioscurus and the leaders of that synod should now suffer the same punishment. The bishops, however, were content to depose Dioscorus alone. The second session on October 10 turned to issues of faith. The faith declared at the councils of Nicaea and Constantinople was affirmed, as were two letters by Cyril of Alexandria and the dogmatic epistle of Leo I. On October 13, additional charges were brought against Dioscorus for having supported the "heretic" Eutyches, for having excommunicated Pope Leo, and for having refused to answer the charges made against him. He was deposed and condemned, although he and a number of his supporters refused to participate in this session. All of the bishops were asked to sign their assent to the so-called Tome of Leo, endorsing the proposition of two natures in Christ. A group of 13 Egyptian bishops and perhaps others refused, saying that they would assent only to "the traditional faith" as defined by the councils of Nicaea and Constantinople. As a result, the emperor's commissioners decided that a new creed would be necessary and presented a text to the bishops. No consensus was reached on this point, and the text of this proposal has not survived. Under considerable pressure from the emperor, who threatened to relocate the council to Italy, the fifth session, held on October 22 finally agreed to publish a new decree concerning the Christian faith. A special commission, consisting of the papal legates, Anatolius of Constantinople, Maximus of Antioch, Juvenal of Jerusalem, and several others, were appointed to draw up this creed. The key clause affirmed "two natures" in Christ without confusion, change, division, or separation. Several more sessions were held, but the major accomplishment of Chalcedon had now been completed. Following the holy Fathers, we unanimously teach and confess one and the same Son, our Lord Jesus Christ: the same perfect in divinity and perfect in humanity, the same truly God and truly man, composed of rational soul and body; consubstantial with the Father as to his divinity and consubstantial with us as to his humanity; "like us in all things but sin." He was begotten from the Father before all ages as to his divinity and in these last days, for us and for our salvation, was born as to his humanity of the virgin Mary, the Mother of God. We confess that one and the same Christ, Lord, and only-begotten Son, is to be acknowledged in two natures without confusion, change, division, or separation. The distinction between natures was never abolished by their union, but rather the character proper to each of the two natures was preserved as they came together in one person (prosopon) and one hypostasis. forbids the carrying off women under pretense of marriage (eloping). Canon 28 grants Constantinople equal privileges (isa presbeia) to Rome. The papal legates were not present for the vote on this canon and protested it afterward. The rule was also not ratified by Pope Leo I and is not recognized as canonical by the Catholic Church. According to some ancient Greek collections, two additional canons are attributed to the council: canon 29, which states that an unworthy bishop cannot be demoted but can be removed, while canon 30 which grants the Egyptians time to consider their rejection of Leo's Tome. With concerns growing that withholding Rome's approval would be interpreted as a rejection of the entire council, in 453 Leo I confirmed the council’s canons, with a protest only against canon 28. Chalcedon completed the work of defining the "orthodox" understanding of the Trinity and christology. However, the nearly immediate result of the council was a major schism. The bishops that were uneasy with the language of Leo's Tome repudiated the council, saying that the acceptance of two physes (natures) in Christ was tantamount to Nestorianism. Efforts to reconcile the two factions would continue unsuccessfully under several future emperors with such ill-advised devices at the Henotikon of Zeno and the condemnation of the "Nestorian" Three Chapters under Justinian I, leading to new schisms between Rome and Constantinople. The Monophysite controversy thus continued to rage for several decades and later reemerged in the form of Monothelitism in the seventh century. Some of the opponents of Chalcedon, including Dioscorus of Alexandria himself, were willing to condemn the outright Monophysitism of Eutyches and opted for a more nuanced position known as Miaphysitism. The churches that followed Dioscorus in this course eventually came to compose modern Oriental Orthodoxy, with the patriarch of Alexandria as their spiritual leader. Recent years have brought about a degree of rapprochement between Chalcedonian Christians and the Oriental Orthodox. Agreement on doctrine has been declared between Oriental Orthodox and Eastern Orthodox and Roman Catholic churches, for instance, although communion between these families of churches has not yet been restored. Need, Stephen W. Truly Divine and Truly Human: The Story of Christ and the Seven Ecumenical Councils. Hendrickson Publishers, 2008. ISBN 9781598562996. History of "Council of Chalcedon"